And thus, our journey begins with the short, but sweet Romance Dawn arc. Named for the one-shot manga that would serve as the catalyst for the development of One Piece, Eiichiro Oda starts off his massively ambitious series with a perfect microcosm of the narrative to come. A substantial chunk of the major themes of the manga see representation not just in the opening flashback, but throughout the arc as a whole. One of the most prevalent themes of One Piece that this arc emits with startling potency is the blurring of good and evil. In the glimpse of Luffy’s backstory that kickstarts the series, we see that Shanks’ crew, while a murderous gang of pirates, is made up of individuals with high moral calibers. This concept is especially apparent in Shanks himself, whose moral compass serves as the basis of Luffy’s values as both a captain of a pirate crew and a goal-seeking individual (we will come back to this idea shortly). This theme of combating traditional notions of good and evil extends out of the flashback into the contemporary section of the arc. The Marines, who are supposedly the beacons of justice in the One Piece world, are immediately shown to have a major corruption problem. Captain Morgan and his son Helmeppo serve as the perfect microcosm for this theme and its centrality in the primary narrative of the manga. Oda doesn’t simply make the pirates the “good guys” right off the bat either. His inclusion of Alvida as the first “antagonist” Luffy faces provides us with a tiny glimpse into the underbelly of the pirate world. I told you I’d get back to it! 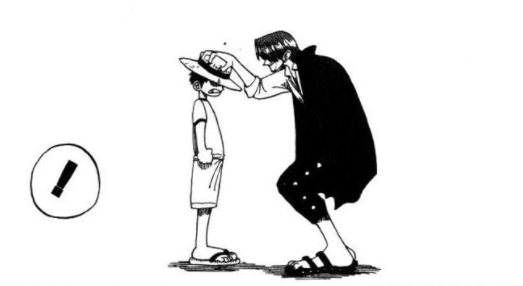 Gol D. Roger’s hat was not the only thing Shanks passed down to Luffy in this flashback. Both Shank’s captaining method and value set as an individual would shape the moral compass of the then young and impressionable Luffy. For example, the way Shanks responds politely and non-violently to the obnoxious gang of bandits was not a behavior Luffy understood at the time. As a child, he couldn’t fathom why Shanks wouldn’t stand up for himself and fight back. As explained by Shanks himself, the message of this scene is that it is sometimes more courageous to refrain from violence in the face of someone who simply isn’t worth it. This is a value that Luffy took to heart as he matured into a young adult. In a genius parallel on Oda’s behalf, he behaves in the same exact way while being harassed by Bellamy and his crew at the bar in Jaya. Coby, the first character Luffy meets after setting out on his journey, is of paramount importance to the overall narrative. Coby and Luffy not only have opposite personalities, but conflicting ambitions. Luffy wants to become the king of the pirates, while Coby wants to become a marine admiral. Both Coby and Luffy are immediately put on parallel, but opposing paths (pirates are the established enemies of the World Government). Although Oda’s story follows Luffy, the narrative could have just as easily followed Coby. Over the course of the series, Coby and Luffy become inadvertent rivals of sorts- a conflict that receives tremendous payoff during the Battle of Marineford in over 500 chapters. At the current point in the series, Coby is a marine captain, while Luffy sits at the helm of the massive Straw Hat Grand Fleet. Both are on exact parallel levels with regards to their progress toward their final goals. This theme of parallel paths is prevalent throughout the manga, especially in the idea of the Worst Generation. Therefore, I’m not going to elaborate on this theme further right now, as it’s time will come once I get to the Sabaody Archipelago arc. Luffy blatantly declares that he wants exactly 10 members in his crew. As of the induction of Jinbe in the current Whole Cake Island arc, this statement will have held true for almost 900 chapters. Oda is a genius at foreshadowing. We clearly witness Shanks use Conqueror’s Haki to save Luffy from the sea king. Although hinted at prior (primarily in the Skypeia arc), this ability would not receive a complete explanation for over 500 more chapters. During Zoro’s flashback, we get a glimpse at the village, and specifically, the dojo where he grew up. Based on the style and aesthetic of this dojo, as well as Oda’s trend of character backstory elaboration arcs (Arlong Park, Enies Lobby, Whole Cake Island) I wouldn’t be surprised if the dojo master Koshiro and, in turn, Kuina, were from Wano. There you have it; we made it through the first arc. Feel free to comment below if you believe I missed anything important, or disagree with any of the points I made above. Next time we will be covering the Orange Town arc, so look forward to that.